The Rome Foundation’s Visiting Professorship expands our impact and reach by sending top GI and Motility clinicians and researchers around the world to share their expertise in the Rome Criteria with fellow physicians, trainees and students. On August 19-20, 2017, Professor Serhat Bor of Ege University in Izmir, Turkey hosted Rome Foundation and Visiting Professor Dr. Magnus Simrén for a two-day special meeting with approximately 40 participants, including the leading Neurogastrenterology and Motility experts in Turkey. During his stay, Dr. Simrén engaged his Turkish colleagues with informative lectures, clinical management talks, and generous discussion sessions on topics such as new developments in Rome IV, a stepwise approach for IBS treatment tailored to individual patient needs, and dietary strategies for managing IBS. Several local clinicians and researchers also presented, making the event a truly interactive collaboration. The collegial nature of the event really came to the fore during the question and answer session at the end of Dr. Simrén’s stay, when presenters and participants shared their ideas on how to improve research and treatment of GI and Motility disorders. An important topic raised during this session was the desire for closer cooperation between The Rome Foundation and the Turkish Society of Gastroenterology, including promoting research projects and providing mentorships for local researchers, projects Dr. Simrén thinks are “worth exploring further, as part of our mission is to increase our global outreach.” Our Visiting Professorship is just one way we can fulfill that mission, and we thank Drs. 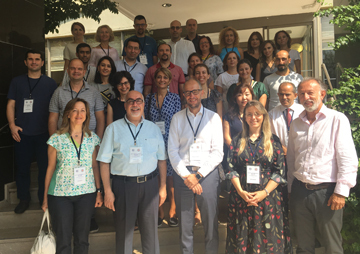 Simrén, Serhat, and all the attendees at Ege University for facilitating The Rome Foundation in its important work to improve the lives of those suffering with GI disorders the world over. What is the Rome Foundation? Recent advances in IBS research of importance for current and future IBS treatment. – A lecture focusing on the link between pathophysiology and new and future treatment for IBS.